Anyhoo, that accounts for why I have not published this post sooner but it feels like the perfect time for me as all I can think about right now is inspiration for doing up a WHOLE HOUSE and there is nowhere better for design inspiration than the Holiday House. A couple of weeks ago I was lucky enough to be invited to a beautiful dinner with the team at Farrow & Ball at the houses (there are actually two of them worth a cool £22m) as they are one of the sponsors and you can spot lots of their colours and wallpapers in the rooms. The houses are an interior design showhouse, where top interior designers showcase their talent to raise funds for The Breast Cancer Research Foundation – each room is designed by someone different so it is filled to the brim with beautiful designs, furniture, styling and the best bit is that everything is for sale, with proceeds also going to the foundation. 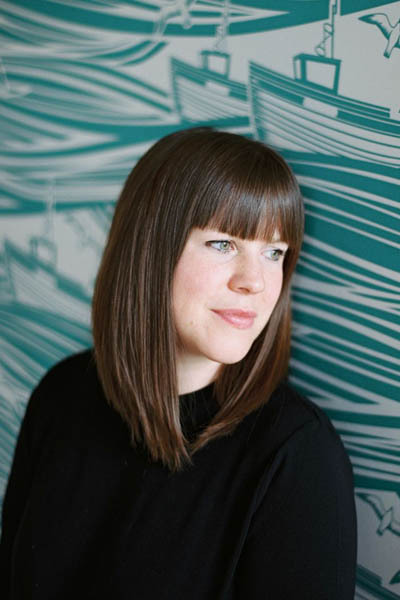 Also hosting the dinner and the tour of the houses was Rachel Laxer who is the co-chair and creative director of the Holiday House in London. It was so wonderful to get her insight on the project and to hear the inspiration behind the cause that it supports. You have this weekend left to visit the house as it closes on Sunday 10th December evening and it would make a lovely day out. You can book tickets here. 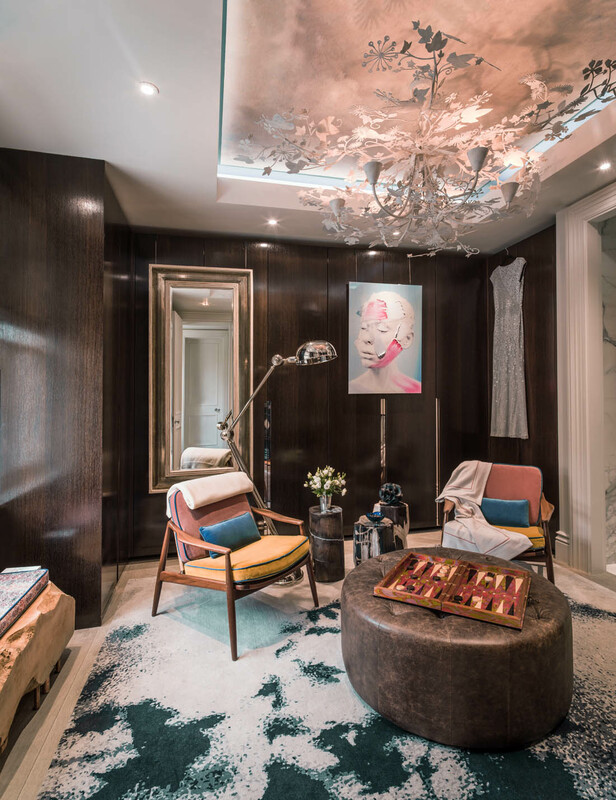 I love the simplicity of this design and the exquisite rug pulls the whole scheme together – CW Design. 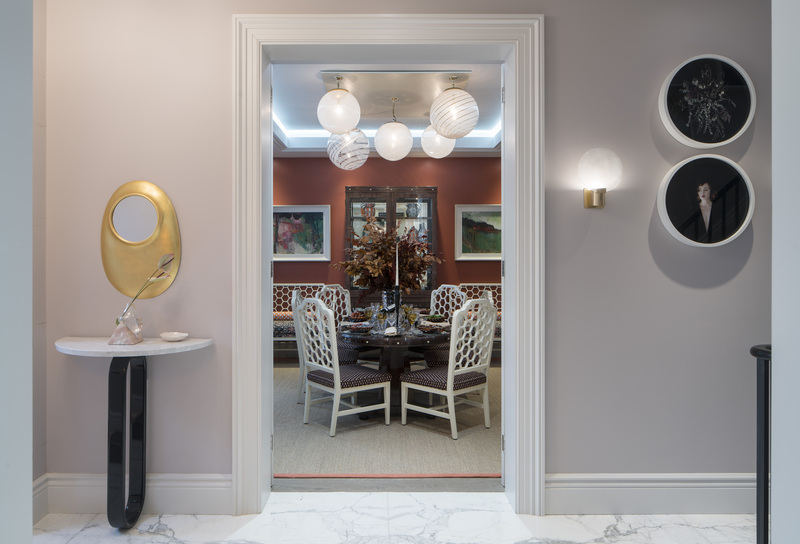 The vintage chairs in this room are the stars of the show – Beth Clancy at Rachel Laxer Interiors. 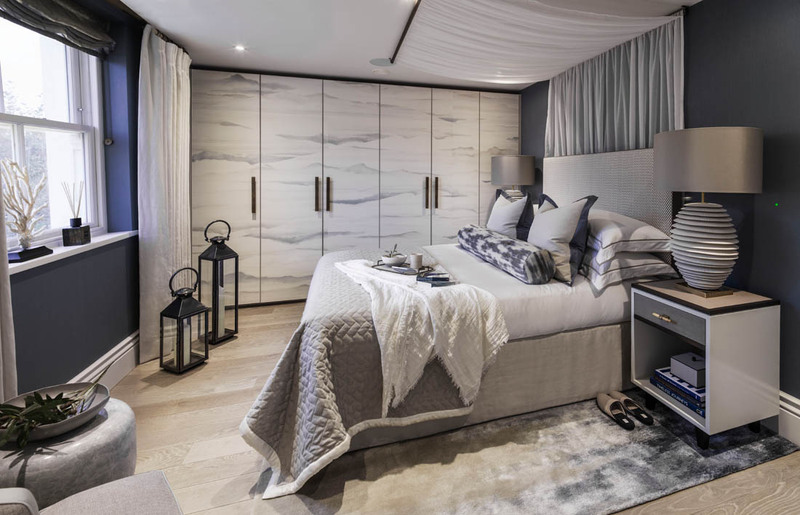 The lovely Laura Hammett, who is a friend of mine, designed this stunning bedroom and I really appreciated the attention to detail of every aspect of the room. The ceramic wall sculpture in Laura’s design was stunning. 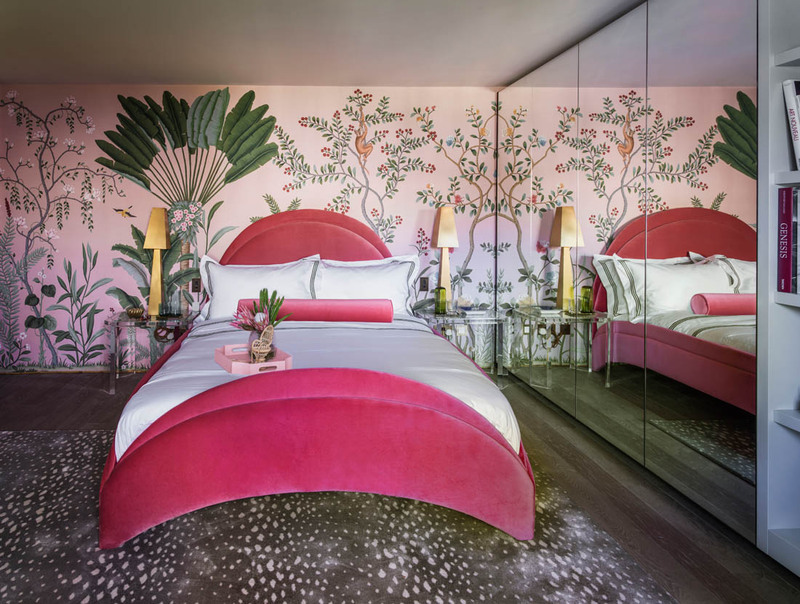 Wallpaper heaven – Amelia Carter Interiors. 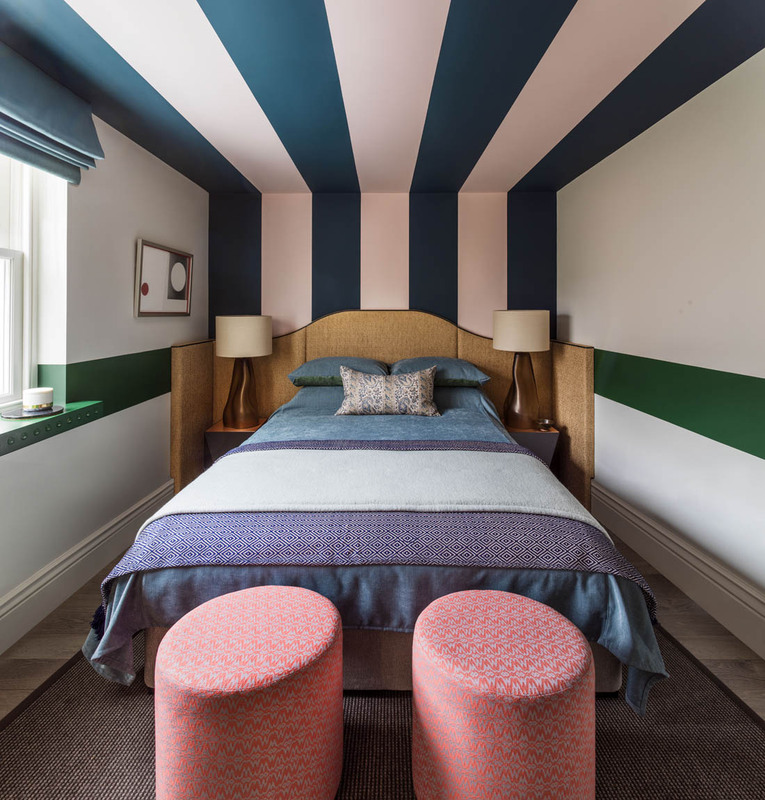 I love the combination Farrow & Ball’s Hague Blue and Calamine stripes in this striking bedroom – Roselind Wilson Design. 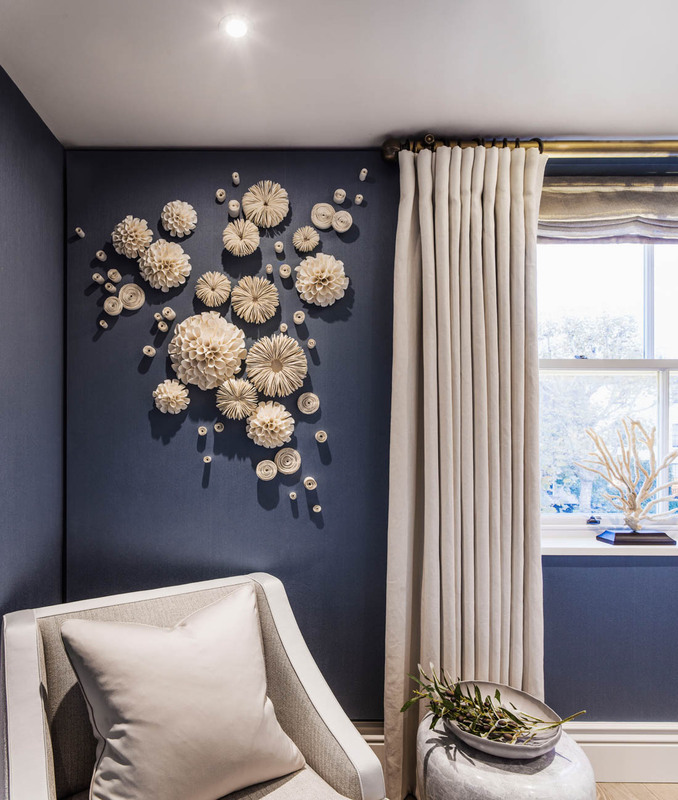 Farrow & Ball’s Peignoir used in the hallway. If you’ve seen my living room you will know that that is one of my favourite F&B colours – Hazel Collins Design. This is Rachel Laxer’s design and is dedicated to her mother, Barbara Stern – a strong breast cancer survivor. I think we spent about an hour with Rachel touring the houses but we could have spent three hours there with no problem at all; there are so many rooms to see and the details in each room need to be soaked up. Buy tickets here to visit this weekend – your last chance! I’m going today! Can not wait.